He is buried in grave VII-H-7 at Dantzig Alley British Cemetery, Mametz, Somme, France. Arthur William Spring Cowie was originally a private [ No. 434] in the Hunts Cyclists, he came from Hamerton, Huntingdonshire, now Cambridgeshire, to enlist in the Hunts. Cyclists at Huntingdon some time before the 23/7/1915 when he first comes to light in the records. 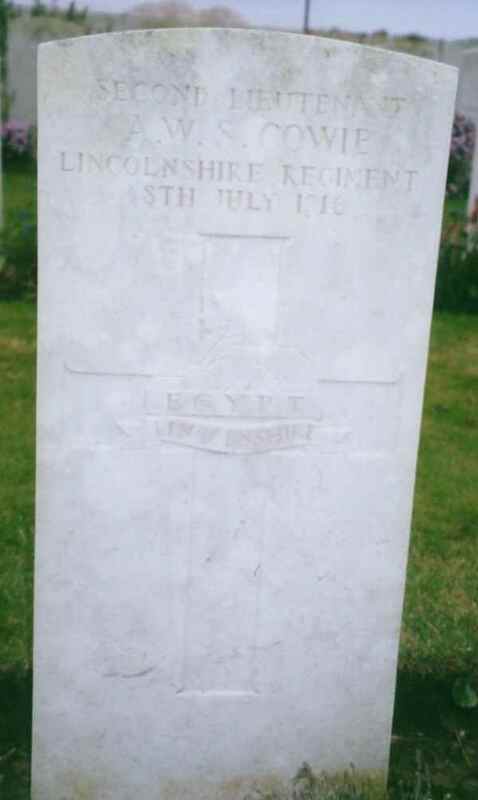 He was later transferred to the 7th Lincolnshire Regt - where as a Temp. Second Lieutenant he was killed in action on the 8th July 1916. He is buried in Dantzig Alley British Cemetery, Mametz, Somme, France in grave number VII-H-7. "He was killed on 15 February 1916, his death occurring under the following circumstances, as narrated by Lieut. A W S Cowie, formerly Classical master at Stamford Grammar School, who performed one of the unrecorded acts of bravery in trying to assist Pte. Miles after he received his mortal wound, and was himself shot in the shoulder whilst with him, but managed to get to a dressing station. The 7th Lincolnshire's had been holding what was known as the International Trench, and were relieved by another regiment. A few hours later the trench was captured by the Germans, mainly through the explosion of mines, and the 7th Lincolnshire's were recalled to retake the trench. After fierce fighting they were so reduced in number that it was necessary to send for reinforcements, and Pte. Miles was sent with a message to headquarters. In order to get there as quickly as possible, it was necessary to go along a trench which was dominated by the enemy posted on a high embankment called The Bluff, on which a number of enemy snipers who could fire into the trench. Pte Miles kept steadily on his way until he came to a part of the trench which had been blown in by the terrific bombardment, and it was whilst climbing over the debris which filled the trench that he was shot: dying later in the day. Beyond the attempt of Lieut Cowie his comrades were unable to offer any assistance." Arthur's wound is recorded in the Stamford Mercury as being wounded in a mid Feb 1916 edition. And his death in the 28 July 1916 edition: "LOCAL OFFICER KILLED - The official casualty list published on Sunday confirmed the rumour that reached the ears of his friends in Stamford that 2nd LT A W S Cowie, Lincs Regt had been killed in action, presumably in the "big push" on the Western Front". The news has been received with deep regret for he was very popular here. At the outbreak of the war he was classics master at the Grammar School, a position he had held for about 3 and half years. He immediately enlisted in the Hunts Cyclist Corps but in Jan of last year he was gazetted to a lieutenancy in the Lincolns, which enabled him to gratify his desire to get to the front speedily. After completing his course, he went out with a draft in October last, and was slightly wounded in the right arm in February. returning to duty abroad in a very short time." Wounded 15th Feb at the Bluff-G S W to shoulder while attempting to bring in Pte Alfred Miles. Wrote to Miles' parents concerning his death. (From Miles' entry in Rutland and the Great War). Commemorated at Stamford's Town War memorial and at Stamford School. The Following data was kindly supplied by James Davies whi is a relation of Arthur - many thanks to him for this data. Discharged at Filet (sp) 27 Jan 1915 "for purpose of being approved to a commission"
France. Without kit or pay, he sends a series of letters asking to rejoin his battalion. It does not appear to have been finally sorted out until the start of May 1916. Applicant for Commission: DoB-8 Mar 1886 - Address-F Company, Hunts Cyclist Battalion stationed at Bridlington, Yorkshire. Able to ride-"a little"
In his Probate it shows a "Frances" as the grantee of the will. The webmaster visited this this cemetery three times and paid respects to his memory - the latest being July 2005.